An Admissions Director takes charge of the admission and recruitment processes in Education, Healthcare sectors which may range from preschools to esteemed universities and from Hospitals to Nursing care. These administrators working along with prospective students, patients and management to disburse the following activities – framing admission processes and procedures, drafting financial strategies, promoting organization, attracting new students, analyzing enrollment statistics, maintaining database of qualified applicants, managing admission staffs and officers, evaluating the academic records of students, arranging tours for students and setting up curricular events for the Institute. 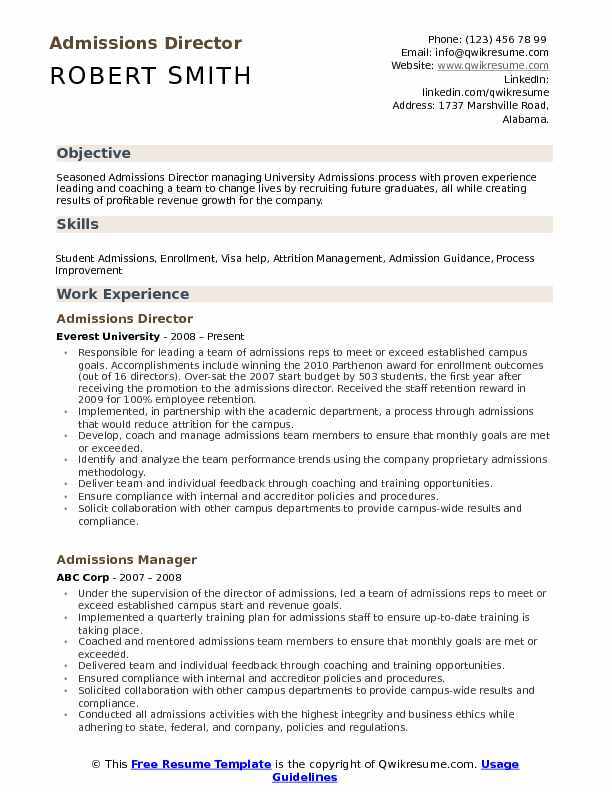 Top qualifications that are normally depicted in the Admissions Director Resume are organizational skills, self-motivation, management abilities, computer literacy and good verbal communication. Those candidates seeking to secure Admissions Director job need to highlight a Bachelor’s or Master’s degree in relevant fields. 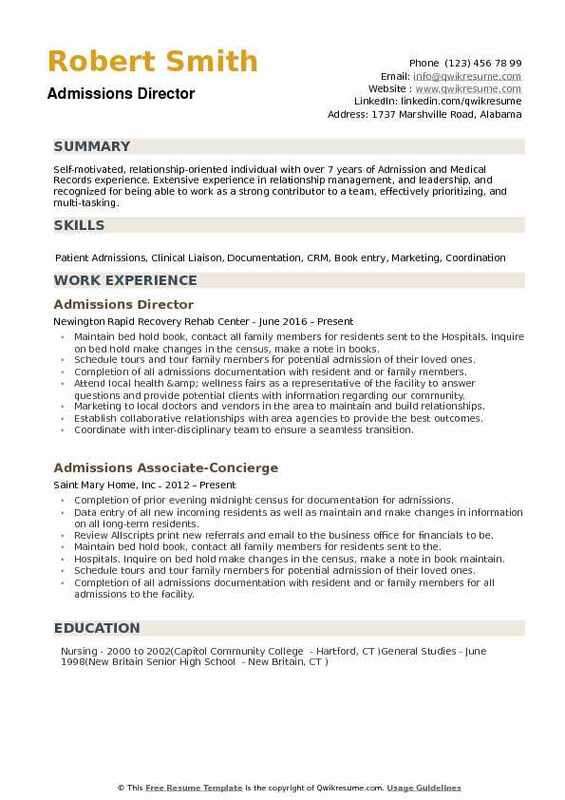 Objective : My work history includes a strong healthcare background to include front desk, central supply, admissions coordinator, admissions director, touring, and administrative support for up to twelve directors. Coordinate admissions for nursing and rehab center for all new patients and returning patients to ensure all required clinical information is available to the admitting nurse. This includes data entry to create accounts for new patients which is subsequently made available to all nursing staff. Complete daily census to include upcoming discharges and admissions. Communicate and discuss any issues; answer any questions regarding same. Creation and upkeep of primary care physician tracking report for incoming patients to open lines of communication between facility and physicians offices. Ensure the data entry provides trending information regarding the location of patients within the area. Maintain client relations to include physicians, home health agencies, other facilities, and hospitals to increase admissions to the facility. Tour family members within the facility and coordinate with heartland health care hospital liaison for new admissions to the facility. Maintained a 95-98% success rate from touring families who then chose the facility for their loved one. Coordinate team meetings, minutes, and update members as necessary. Create documents and reports to assist in keeping team members informed. Assist with events planning for the facility and outside events where the facility is involved. Maintain processes within the facility to ensure the continuation of communication between departments as they pertain to admits and discharges. Continuous updates to the system to ensure all patient/family information is accurate in accordance with HIPAA laws. Responsible for ensuring the admissions agreement and contracts are signed by new patients in a timely manner and consequently filed appropriately in the business office. 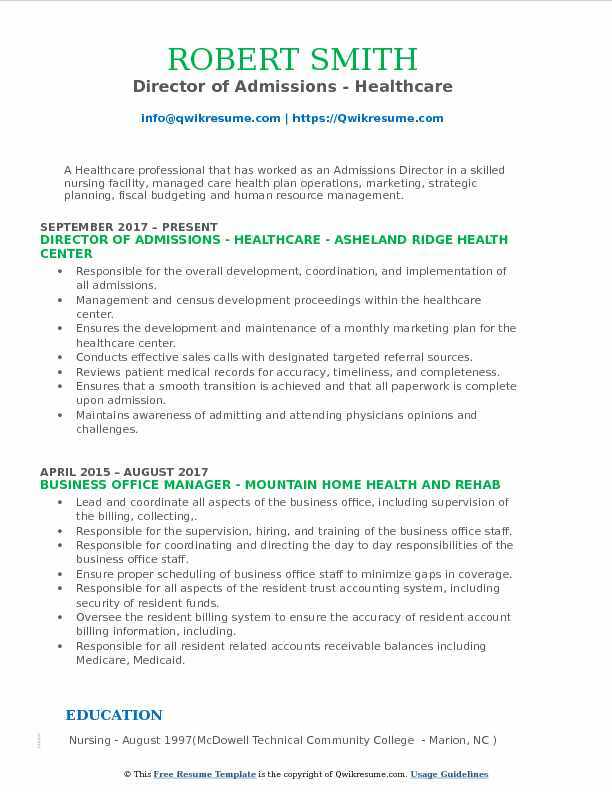 Summary : I am a highly motivated professional with many years of experience in the medical field seeking to secure a managerial position within a dynamic company which will allow me to grow, exercise, and expand my professional skills. Direct interaction with marketing team for public relations and census development. Address patients, family members questions and concerns by providing tour and information about the facilities. Represent the facilities at many local hospital workshop events to educate case managers and social workers about our services and to assist them with discharge planning. Conduct insurance and obtain authorization from managed care organization for skilled nursing facility and rehab hospital admissions. Interact with nurse liaisons and case managers addressing all patients medical needs to ensure a smooth transition from the acute care hospitals to the facilities. Participate in yearly skilled nursing facility agency for health care administration survey preparedness. Mentor and train new hires with methods to increase productivity within the admitting department. Collaborate with the nursing team to minimize or control the cost of expensive medications. Knowledge of centers for medicare and medicaid services (cms) star ratings system. Ensure company policies and legal guidelines are communicated and followed at all times within the admitting department. Delegate responsibilities and supervise the work of the admitting staff. Analyze problematic situations and occurrences and provide solutions to ensure smooth daily operation. Headline : To secure a position of responsibility within the field of Healthcare Administration in which both educational knowledge and practical experience can be fully utilized to drive results. As Admissions Director/Care Coordinator, actively seek Referrals and maintains In-house Census Goals By Seeking And Initiating Marketing Strategies And Processes. Communicates clearly with healthcare workers, doctors, nurses, families, and patients on a daily basis. Works with medical records and organizes and processes this information for use in our facility and with referring medical facilities. 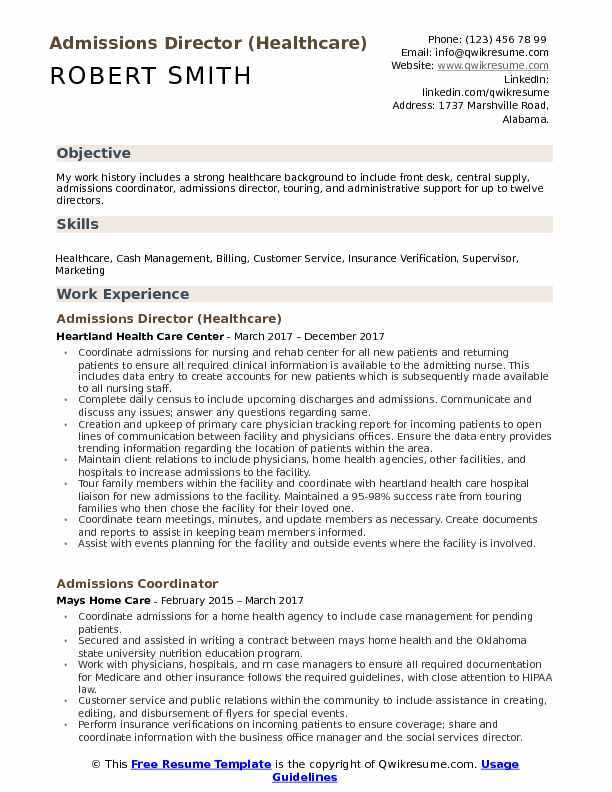 Uses computers to input data and occasionally uses coding and classification software and electronic health record (EHR) systems. Resolves patient/family dissatisfactions by investigating concerns; recommending changes in service policies and procedures. Prepares admissions reports by collecting, analyzing, and summarizing data and trends. Keeps patients safe by following safety policies, procedures, and regulations. Protects organization reputation by keeping information confidential. Updates job knowledge by participating in educational opportunities; reading professional publications; maintaining personal networks. 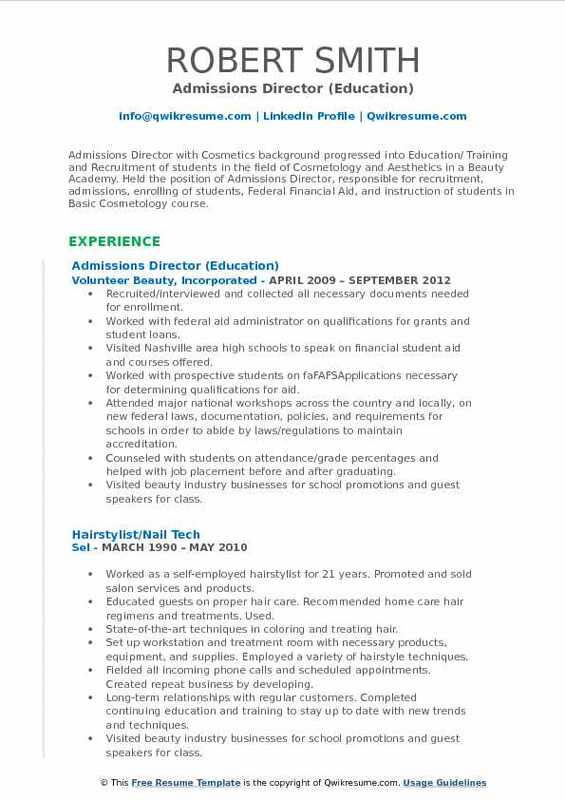 Summary : Admissions Director with Cosmetics background progressed into Education/ Training and Recruitment of students in the field of Cosmetology and Aesthetics in a Beauty Academy. 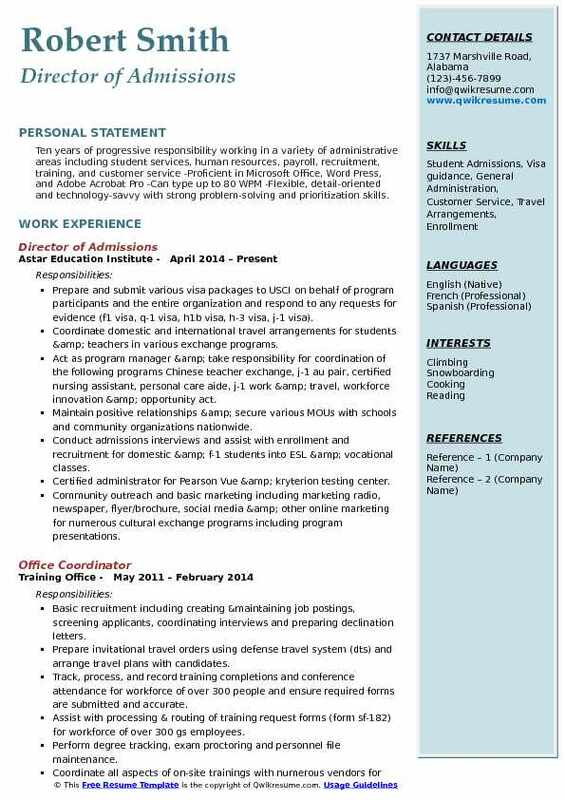 Held the position of Admissions Director, responsible for recruitment, admissions, enrolling of students, Federal Financial Aid, and instruction of students in Basic Cosmetology course. Recruited/interviewed and collected all necessary documents needed for enrollment. Worked with federal aid administrator on qualifications for grants and student loans. Visited Nashville area high schools to speak on financial student aid and courses offered. Worked with prospective students on faFAFSApplications necessary for determining qualifications for aid. Attended major national workshops across the country and locally, on new federal laws, documentation, policies, and requirements for schools in order to abide by laws/regulations to maintain accreditation. Counseled with students on attendance/grade percentages and helped with job placement before and after graduating. Visited beauty industry businesses for school promotions and guest speakers for class. Compiled annual reports required by the national accrediting commission for the career of arts and worked with state agencies to help students with needs in order to keep them enrolled in school. Summary : Ten years of progressive responsibility working in a variety of administrative areas including student services, human resources, payroll, recruitment, training, and customer service -Proficient in Microsoft Office, Word Press, and Adobe Acrobat Pro -Can type up to 80 WPM -Flexible, detail-oriented and technology-savvy with strong problem-solving and prioritization skills. Prepare and submit various visa packages to USCI on behalf of program participants and the entire organization and respond to any requests for evidence (f1 visa, q-1 visa, h1b visa, h-3 visa, j-1 visa). Coordinate domestic and international travel arrangements for students & teachers in various exchange programs. Act as program manager & take responsibility for coordination of the following programs: Chinese teacher exchange, j-1 au pair, certified nursing assistant, personal care aide, j-1 work & travel, workforce innovation & opportunity act. Maintain positive relationships & secure various MOUs with schools and community organizations nationwide. Conduct admissions interviews and assist with enrollment and recruitment for domestic & f-1 students into ESL & vocational classes. Certified administrator for Pearson Vue & kryterion testing center. Community outreach and basic marketing including marketing radio, newspaper, flyer/brochure, social media & other online marketing for numerous cultural exchange programs including program presentations. Assist with accreditation packages and processes for the department of veterans services-saa, schev, & accet. Basic office duties as assigned including office recruitment, greeting visitors, answering multi-line phones, assisting teachers in classroom preparations, textbook inventory, bank deposits, obtaining/tracking tuition & textbook payments and maintaining international and domestic student files. 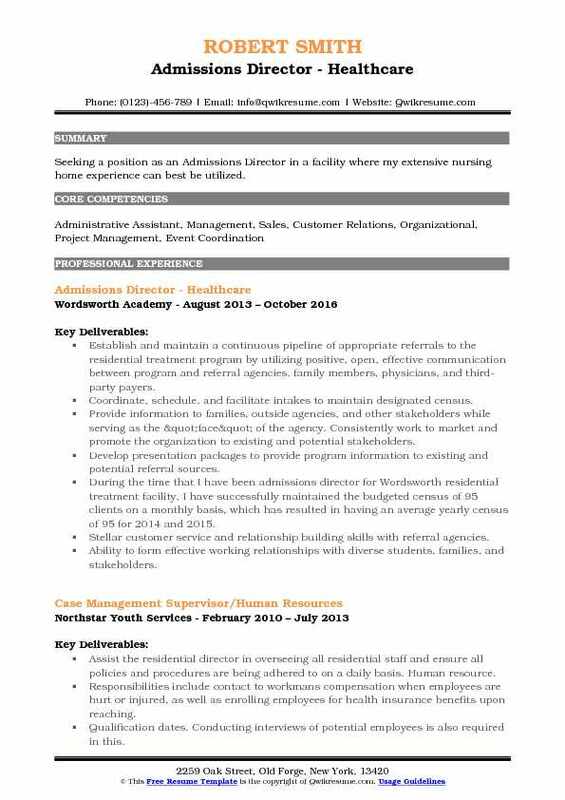 Summary : Over ten of experience across a broad background of Admissions, accounting, human resources, staffing. Strengths include communication skills, organizational skills, interpersonal skills, and team building. Major Accomplishments. Assess inquiries when necessary and respond to referrers promptly, facilitates admission decisions and ensures positive admission experience for customer and family. Coordinates tour, application, and sales processes with customers, families, and referrers, either personally or with appropriate backup systems. Meets census goals by working with the center interdisciplinary team and network entities to coordinate customer flow into and through the nursing center. Communicates admission criteria to referral sources, customers and families. Participates as an active member of treatment team meetings, advising others about observations and recommendations. Overseeing the admission process, tracking referrals, planning and maintaining strong Medicare and private pay census. Responsible for maintaining a 98% occupancy rate at a 130-bed facility. Work with local hospitals to gain patients for a short-term rehab, and long-term care unit. 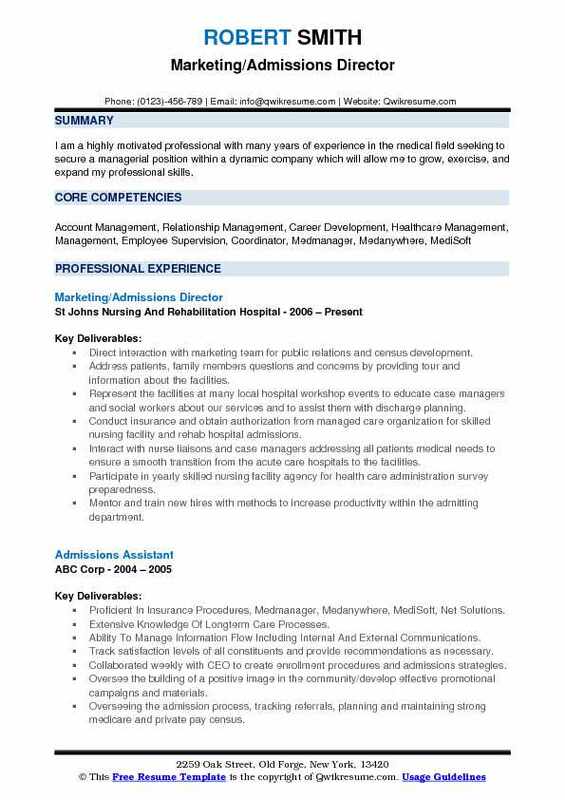 Objective : A Healthcare professional that has worked as an Admissions Director in a skilled nursing facility, managed care health plan operations, marketing, strategic planning, fiscal budgeting and human resource management. Responsible for the overall development, coordination, and implementation of all admissions. Management and census development proceedings within the healthcare center. Ensures the development and maintenance of a monthly marketing plan for the healthcare center. Conducts effective sales calls with designated targeted referral sources. Reviews patient medical records for accuracy, timeliness, and completeness. Ensures that a smooth transition is achieved and that all paperwork is complete upon admission. Maintains awareness of admitting and attending physicians opinions and challenges. Effectively networks with current and past customers to solicit referrals. Maintains an active involvement in the community organizations and associations. 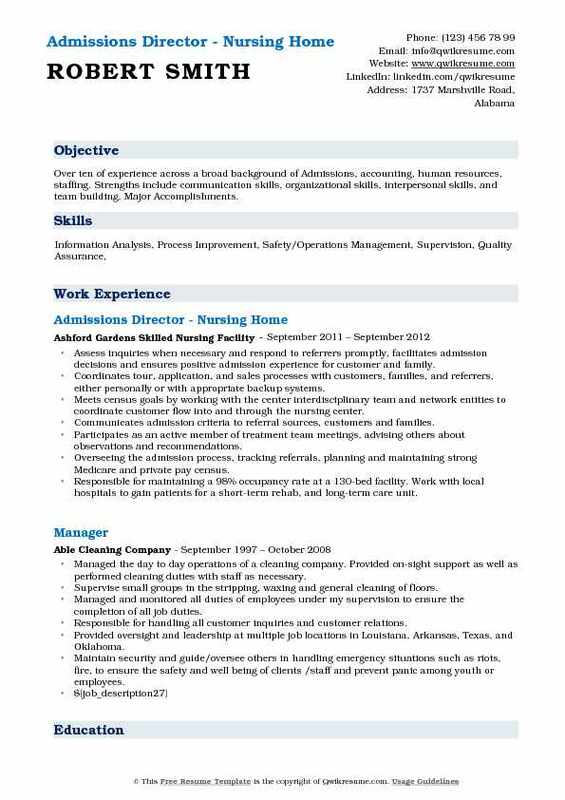 Summary : Seeking a position as an Admissions Director in a facility where my extensive nursing home experience can best be utilized. Establish and maintain a continuous pipeline of appropriate referrals to the residential treatment program by utilizing positive, open, effective communication between program and referral agencies, family members, physicians, and third-party payers. Coordinate, schedule, and facilitate intakes to maintain designated census. Provide information to families, outside agencies, and other stakeholders while serving as the "face" of the agency. Consistently work to market and promote the organization to existing and potential stakeholders. Develop presentation packages to provide program information to existing and potential referral sources. During the time that I have been admissions director for Wordsworth residential treatment facility, I have successfully maintained the budgeted census of 95 clients on a monthly basis, which has resulted in having an average yearly census of 95 for 2014 and 2015. Stellar customer service and relationship building skills with referral agencies. Ability to form effective working relationships with diverse students, families, and stakeholders. Ability to handle a variety of duties which may be interrupted or changed by immediate circumstances. 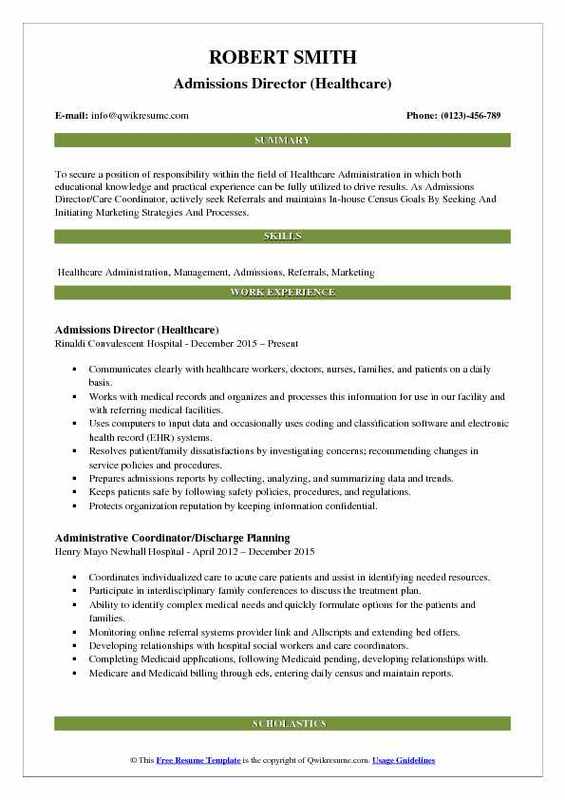 Objective : Customer driven Admissions Director with over eight years of experience in the healthcare industry. Demonstrating strong marketing leadership and uncompromising focus on fulfillment of client needs within the capabilities of our facilities. Successful in increasing revenues, managing quality mix and building a culture that is census driven. Handle inquiry calls from hospitals, families, etc. , and provide appointments that include a presentation, tour, and closing. Maintain a working knowledge of federal and state regulations and reimbursement. Work with nursing and housekeeping staff to maintain knowledge of the number of beds available. Maintain relationships with legal and financial professionals, senior organizations, assisted living and senior housing facilities, appropriate special interest groups, churches and other community contacts. Communicate special needs of new admissions to staff to ensure a smooth transition. Check insurance and obtain authorization for admissions to the facility. Responsible for maintaining positive census by marketing center to the community and healthcare professionals in defiance and surrounding area. Submission of resident and financial reports, verification of insurance benefits for new referrals and interaction with families on a daily basis. 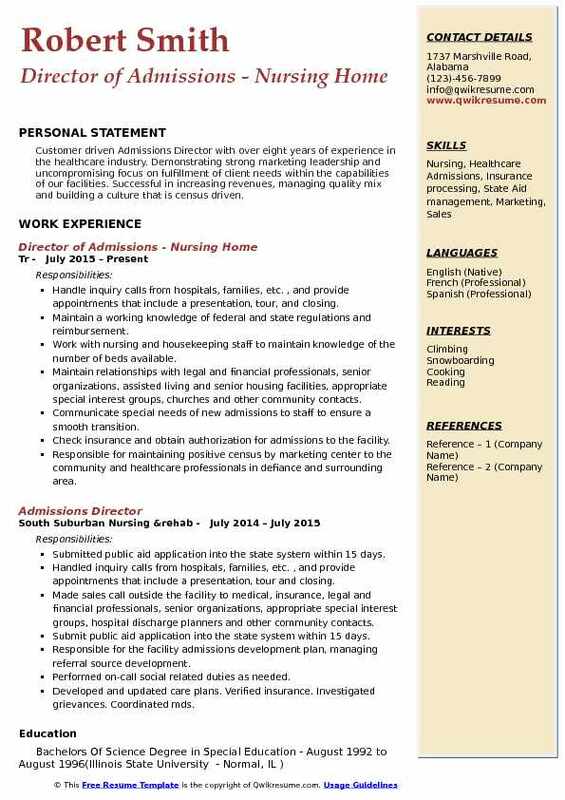 Headline : Self-motivated, relationship-oriented individual with over 7 years of Admission and Medical Records experience. Extensive experience in relationship management, and leadership, and recognized for being able to work as a strong contributor to a team, effectively prioritizing, and multi-tasking. Maintain bed hold book, contact all family members for residents sent to the Hospitals. Inquire on bed hold make changes in the census, make a note in books. Schedule tours and tour family members for potential admission of their loved ones. Completion of all admissions documentation with resident and or family members. Attend local health & wellness fairs as a representative of the facility to answer questions and provide potential clients with information regarding our community. Marketing to local doctors and vendors in the area to maintain and build relationships. Establish collaborative relationships with area agencies to provide the best outcomes. Coordinate with inter-disciplinary team to ensure a seamless transition. Take calls from hospitals regarding referrals for potential admissions, review clinical and financial information for admission. Maintains up-to-date knowledge of current regulations governing Medicare / Medicaid and private insurance company reimbursement processes. Ensures all required records are maintained and submitted, as appropriate, in an accurate and timely. Summary : Seasoned Admissions Director managing University Admissions process with proven experience leading and coaching a team to change lives by recruiting future graduates, all while creating results of profitable revenue growth for the company. Responsible for leading a team of admissions reps to meet or exceed established campus goals. Accomplishments include winning the 2010 Parthenon award for enrollment outcomes (out of 16 directors). Over-sat the 2007 start budget by 503 students, the first year after receiving the promotion to the admissions director. Received the staff retention reward in 2009 for 100% employee retention. Implemented, in partnership with the academic department, a process through admissions that would reduce attrition for the campus. Develop, coach and manage admissions team members to ensure that monthly goals are met or exceeded. Identify and analyze the team performance trends using the company proprietary admissions methodology. Deliver team and individual feedback through coaching and training opportunities. Ensure compliance with internal and accreditor policies and procedures. Solicit collaboration with other campus departments to provide campus-wide results and compliance. Conducts all admissions activities with the highest integrity and business ethics while adhering to state, federal, and company, policies and regulations. Monitor admissions activity, trends, and outcomes through campuswide reports.